As former students will attest, their profile is more than just an SAT score and frankly they’re right to think so. Basing an entire academic analysis on one score is narrow minded, but luckily students have more options than ever to further their education and Zinch is here to help. Zinch is a web platform for connecting students with scholarships and future education resources. There are over $1.9 billion in scholarships available, but finding the right match can be a daunting, even impossible task. Zinch works to match scholarships to students by gathering several factors which narrow down scholarship availability and thus make the scholarships more fine tuned towards each student. Factors like student status (grade level), zip code, GPA, heritage, ethnicity, citizenship and several other qualifications all contribute to how scholarships are provided to students. Students can choose from a list of scholarships displayed in a sidebar and apply with the click of a button or ‘Like’ scholarships to receive reminders from Zinch about upcoming deadlines. Some things that make Zinch stand apart from other online services is their willingness to reward students on their own. Students who use Zinch and are awarded a scholarship found through the service can earn double the amount, with the surplus paid by Zinch. 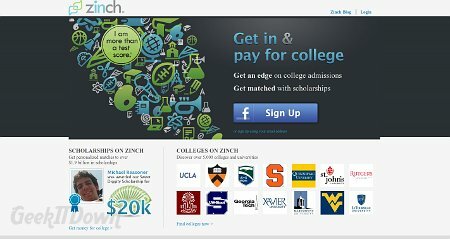 Additionally, Zinch has a unique ‘Mooch’ feature which allows students to earn based on scholarships their friends are awarded. Students can invite their friends to Zinch and if a friend is awarded a scholarship, Zinch will award the referring student an equal amount. With so many ways to earn money for college, students could pile up the cash quickly if they stick with it. In addition to scholarships, Zinch provides a search feature for finding colleges and universities which match student criteria. Looking for a smaller more personal campus environment or perhaps a four versus two year program? Zinch narrows the field down and compiles a list complete with school details, videos and current student listings. Many students know the field of study they want to pursue, but finding the right school is problematic. There are so many choices, by narrowing down the options Zinch makes the process a little less convoluted. As if scholarships and universities aren’t enough, Zinch provides several other meaningful resources for students looking to further their education. Have you thought about studying abroad? How about test preparation? Zinch lists the opportunities available and explains briefly what each choice offers. Those features coupled with upcoming college events from a variety of educational institutions and personally connecting with other students ensures Zinch members have fun as well as benefit tremendously from the Zinch resources.